You must be a member of the Southampton Spontaneous Activities Group to attend this activity. Would you like to join this group? this year, WestQuay hosts a spectacular light show again! Let's go and get mesmerised! Sitting in front of the city walls is the new Esplanade, a fantastic event space and public realm. Take a walk through the Esplanade and see the amazing light installations including Fire and Ice, where you will be able to control each of the forces as it tracks your body movements. 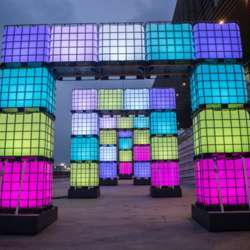 There’ll also be giant container illuminated arches you can walk through, an interactive ocean of light and giant LED stars! Enjoy a special showing of the History of Southampton light projection every night at 6pm from Thursday until Sunday!